Instructor User Guide ProfileHow do I add pictures to my profile picture gallery? Click the Choose File button to browse for images on your local computer and select them for upload. You may select more than one image if you like. The maximum number of profile gallery images is 10. Selected files will appear listed below the Choose File button. 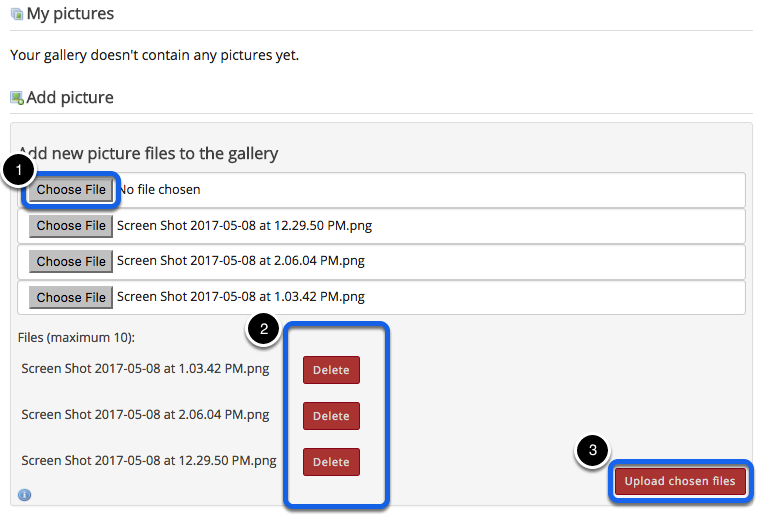 If you decide not to upload a given image, you can click Delete to remove a file from the list. Once you have selected your file/s, click the Upload chosen files button. Note: The combined file size of all images to upload should not exceed 20MB. Once your images have been uploaded, they will display under "My Pictures". Prev: How do I post to my wall? Next: How do I search for and add connections?